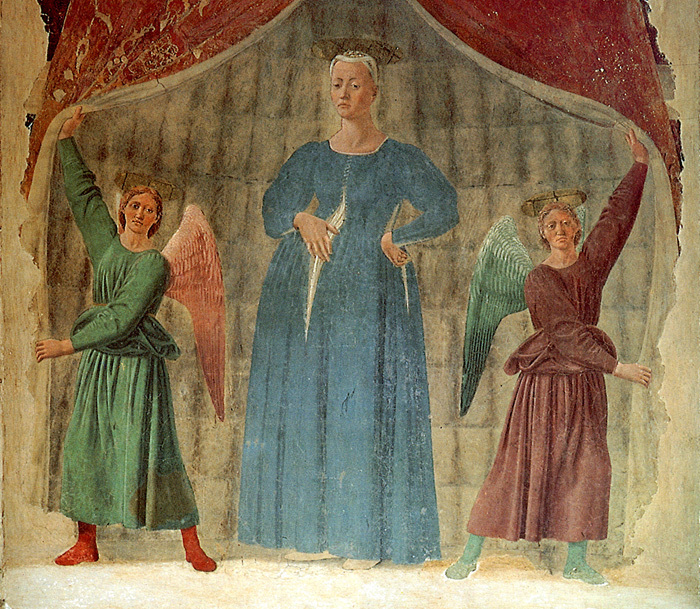 There are several paintings I return to over and over, the glorious Madonna del Parto by Piero della Francesca is one of them and probably my favorite. It is at once simple and complex, modest and bold, reverent and earthy. The teenaged Mary steps forward as two angels hold back heavy brocade curtains, the tips of the fingers of her right hand inserted in a slit in her dress. That gesture, at the center of the picture, references the act of incarnation that Catholics believe is “immaculate” or sexless. Piero painted this for the church of Santa Maria di Momentana (formerly Santa Maria in Silvis), in the hilltown of Monterchi. It was difficult to explain this sexless incarnation to peasants who toiled next to life and death all day and knew exactly how all manner of beasts and babies were conceived. Many painters from Fra Lippo Lippi tried, but perhaps this earthy, gravid young madonna, with her suggestive gesture, was comforting. Perhaps it gave the nuns something to smile about. Some images influenced by the Madonna del Parto. This entry was posted in Drawing, Gouache, Painting, Sketchbook, Watercolor and tagged cross, female forms, feminist art, incarnation, sacred, truecross, vaginal imagery by vspain. Bookmark the permalink.